I graduated from UCL with an MSci in Biological Sciences in 2015, where my final year research project investigated the role of adult retinal stem cells in regeneration. I then spent three months as a summer research student at Imperial College London investigating the roles of voltage-gated sodium channels in metastatic breast cancer. 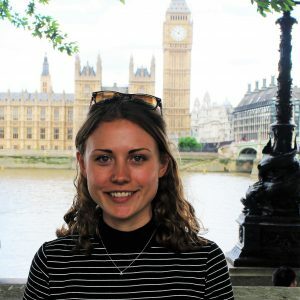 Keen to gain industry experience, I worked for St John’s Laboratory, a start-up biotechnology company, as Marketing and Business Development Assistant, before starting the MRC DTP at King’s on the 1+3 programme. What I enjoy most about scientific research is striving to find the most effective treatments for diseases in order to alleviate the suffering of patients that face them, and so I was drawn to the DTP due to the translational focus of the research projects on offer. There is also a wide range of workshops, seminars and opportunities available, providing comprehensive training for the PhD and beyond. I also couldn’t bring myself to leave the excitement of London after living here for the last 5 years! Since starting, I have gained exposure to a wide breadth of research fields and multidisciplinary techniques through varied rotation projects and workshops. Already, I have been able to connect with a broad network of researchers across different labs at King’s and from other institutions. I have also enjoyed being involved in opportunities at King’s outside of the DTP, including becoming Business Development Director for Innovation Forum.